Scientific research has proved that the brain takes in more information only when in a comfortable and condusive environment. Our classrooms are bright, technology enabled and fully air-conditioned. To ensure each child benefits from the learning experiences at school, we have an ideal teacher child ratio. What we learn with pleasure we never forget. The indoor play area fosters teacher supervised and guided play activities that promotes a healthy mind in a healthy body. 1. Our three science Laboratories are modern and flexible for both tutorial work and individual research. Digital projection facilities enhance the quality, clarity and accessibility of academic information. The school has a well established Computer Center and in-house technicians. It facilitates individual, peer and teacher centered upgradation. 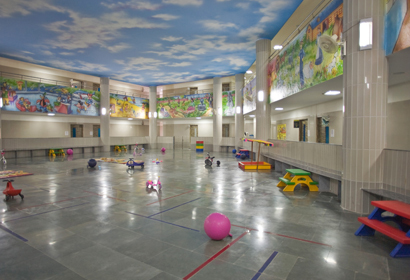 The charm of this facility within the architectural design of the building is spectacular. The AV support team forms part of this teaching learning. It aids and supplements the curriculum and thirst for technology in today's education system. 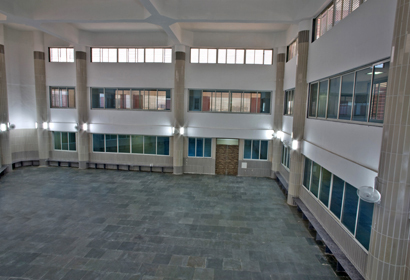 Examination Hall provides an enlightening, quiet space to enliven the mind dealing with examination fever. Supports a safe learning environment guiding students academic, behavioral and social growth. The acoustical design of our auditorium is phenomenal. The specific demands of the performing arts, celebrations, seminars etc. conducted by the school are held here. This facility makes travelling safe and comfortable for students. It relieves anxiety in today's age of career and business oriented parents.